Day-one, or as we’re calling it: “Party in the Park“: will feature a little of everything from American comfort food, street food, pizza, Spanish and Latin flavors, to some Italian, and of course, some healthy options for you. Through it all, you’ll see Fairfield County favorites along with some new vendors that don’t make their way to our area often. Get your tickets here. If you have a sweet tooth, we’ve got you covered all weekend with some great dessert options. Kona Ice, Longfords Ice Cream, Bona Bona Ice Cream, The Cannoli Truck, and Donut Crazy are amongst the tasty treats. If you couldn’t tell, I’m so excited about this initial line-up and even more excited that this is just the start of it. Over the next several weeks we’ll be announcing more great additions! 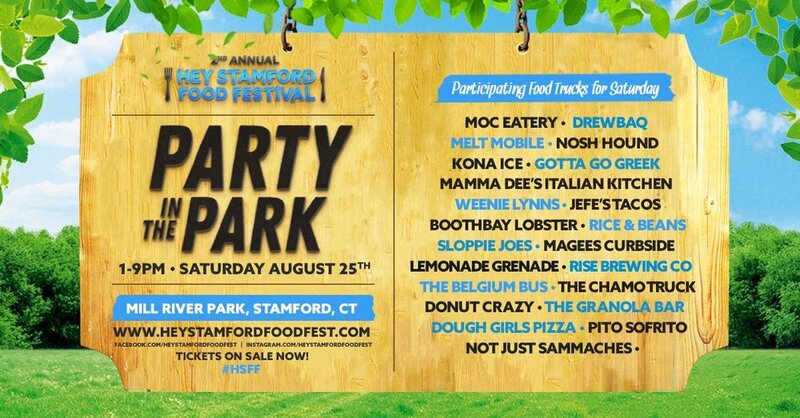 Don’t forget to keep your eyes peeled to @HeyStamford and @HeyStamfordFoodFest on Instagram along with our Facebook page as we’ll be featuring each of these vendors leading up to the event. If you don’t have your tickets, it’s OK. Our Early Bird rate has expired, but you’ve still got a chance to get discounted tickets, but do it soon! Ticket prices will increase again July 1st! Tickets are currently just 12.50 per day or the best value is the two-day ticket for just $20.00. Whichever you choose you’ll have access to a full concert experience, our beer garden, great games, kids zone and as we highlighted above, many amazing food vendors!